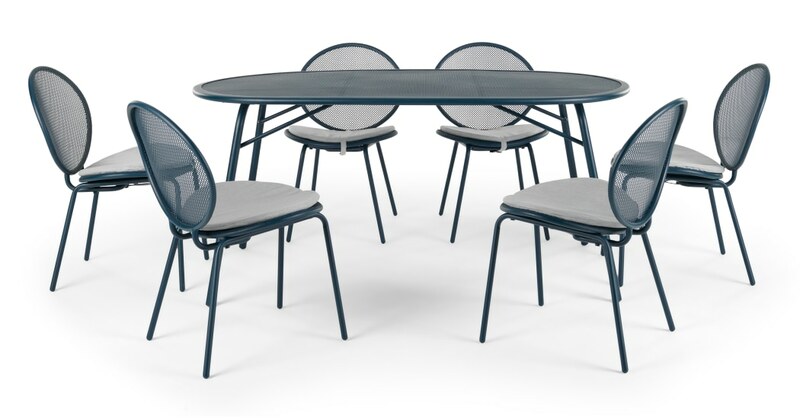 This is a bold garden addition – the perforated tops, blue metal frames and large oval shape make this a dining set for those who want a truly great outdoors. Navy blue powder-coated metal makes this an unusual choice – the colour pop is subtle, but adds personality to your space. Plus, its punctured top adds extra appeal. The 6 dining chairs come with removable grey cushions – a comfy addition. The dramatic, oversized back and seat are circular in shape, and daring in design.